Many coaches and riders focus solely on the sessions in a training plan. But if your legs are not fully recovered and able to work at their maximum, you won’t benefit fully from these workouts. Planning recovery, and doing things to promote it, is almost as important as the training itself. Recovering properly allows you to perform during each session, but it’s not just for those out there racing or training hard day in day out. All cyclists, however much they do, can benefit from better recovery. Even if you only ride at the weekend, recovery is vital. Doing the right things after your Saturday ride can help you stay fresh enough to enjoy yourself and perform on a Sunday ride too. For those looking for fitness improvements, recovery is even more important. Recovering is what lets you push hard again in the next session. If you are unable to push to the desired level in a session, it’s virtually pointless. The recovery process begins as soon as you walk in the door after a ride, or when you climb off the turbo-trainer. During training, muscles are damaged and torn, especially during tougher sessions. Once repaired, these muscles become stronger. This is known as the training effect, allowing progression – riders get stronger and faster. The tears, combined with the residual waste products that build up after exercise, are what makes your legs feel stiff, heavy and sore following training. Repairing these tears and making sure waste products are evacuated from muscles is important before embarking on more training. Ensuring this happens quickly and effectively means a speedy recovery that will allow you to train properly again the next day. There are many different ways to speed up the recovery process. Advances in technology and research mean there are more options than ever available. Compression wear has been around for over 50 years and was initially used in medicine to help recovery from injuries and aid circulation. In the last 15 years, compression garments have become enormously popular in the sports world, aiding performance and recovery. Unlike in other sports, in cycling UCI rules dictate that long compression socks are banned, so many riders only use compression gear after riding, to improve recovery. 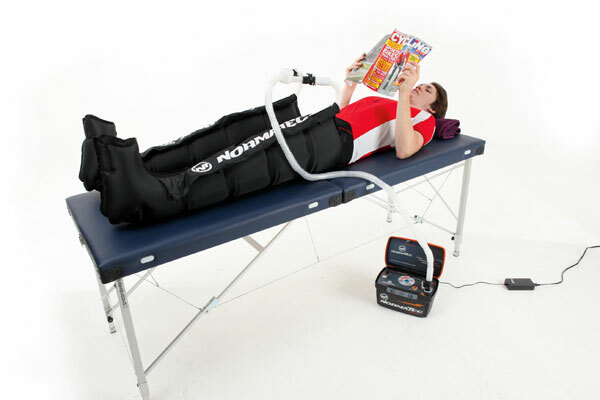 NormaTec was founded by a physician bioengineer who realised that, to progress compression technology, a unique massaging pattern was needed. The recovery system works by using sequential pulse technology to speed up muscle recovery. Different segments of the trousers blow up, one at a time, which feels similar to a blood pressure cuff, and pushes metabolic debris out of the muscles. The system pulses, starting at the foot, instead of just squeezing the muscles. This simulates a system the body uses to get rid of metabolic waste: muscle pump. This active system removes waste more effectively than static compression. Once the pulsing has ended in the foot section, the section remains inflated, compressing the area. This prevents backflow of the fluids, which are carrying the waste, back down the leg. While the foot section holds, the pulsing begins in the next segment. The same things occurs, and the second segment holds, while the third section begins pulsing. At the same time, the foot section stops holding and the pressure is released. This enables a full rest from the compression before the next cycle starts. This continues along the segments to the top of the leg and then begins again at the bottom. Though it’s an odd sensation, we found it gave our legs a fresh feeling, similar to a massage. NormaTec technology does carry a hefty price-tag, though, but if you use it as an alternative to regular massage, it will save you money over time. Renting this piece of kit may be a more affordable option, with a weekly rate of £35. The first vital post-training priority is refuelling your body. Hopefully you have kept on top of your nutrition and hydration during your riding and now it’s time to replace carbohydrate and protein as well as other essential vitamins and minerals. When you train, you deplete carbohydrate stores, which are used up giving energy for your session. Replacing these lost carbs is vital. At the same time, taking on proteins is important, as these are needed to fix the muscle damage. The sooner these are replaced the better, so get a recovery shake down your neck before jumping in the shower. Have a proper meal as soon as possible thereafter, within an hour. While protein shakes are great, research shows that getting carbohydrate in at the same time speeds up the recovery process. A meal high in carbohydrates will release a significant amount of insulin that transports carbs and amino acids to our muscles, which results in an acceleration in carb resynthesis. Protein balance will also turn positive. Compression clothing has been around a while, and many people use it for during sports as well as to aid recovery afterwards. These are similar to the socks and tights given to people with bad circulation or for long-haul flights. The idea is to aid lymphatic drainage and venous return, which basically means they help get rid of the debris left in the legs after a tough workout. They aid the body’s ability to pump blood back up away from the muscles by means of their squeezing effect, which opens up blood vessels. The support given by compression clothing helps the muscles if they have been badly damaged during a ride. Ice baths have been used by athletes for years and have been shown to reduce swelling. So, after a hard workout where muscle damage has occurred, an ice bath may reduce inflammation. The one downside is that this cooling of the muscles also stops blood flowing effectively, meaning any metabolic waste built up during exercise may be left behind in the muscle. Sitting in a bath also gives a compression benefit and can help give legs a squeeze, similar to compression wear. This is a step up from ice baths: moving between hot and cold water. The benefit over plunging into an ice bath is that the hot periods aid circulation to help remove waste products as well as reducing muscle soreness. Alternating between 10mins hot and 10mins cold for 40mins is enough to help aid recovery significantly, it is claimed. Always ensure you finish on a cold cycle, though. This can be done just using a shower and changing the temperature, although this means the water can only be directed to one area of the leg at a time – not as effective as a full bath and with no compression effect. Stretching reduces muscle tightness and soreness, according to some research. Holding a range of leg and back stretches before getting into bed may reduce muscular soreness. Stretching as part of a daily routine has been shown to also have performance improvements and may help riders, as it helps keep muscles supple, reducing the likelihood of injuries if you crash. The basic principle behind a foam roller is to be able to massage yourself, taking away the cost of going and seeing a specialist, which may also be less hassle. The one problem is getting the technique right so as to be effective. Though using a foam roller does allow you to target specific problem sore or knotted areas, the roller’s action may not prove as effective as proper massage. Different rollers have different levels of hardness, shape and size, so research is important before buying. It’s also important to use the roller correctly. Finding a good sports masseur who know what they’re doing is important. Pros have massages on a regular basis. A good massage is tailored to your needs, working on specific problem areas, as well as pushing waste products out of the muscle. A good massage may be the best recovery technique available, working the muscles as hard as is necessary. The Tour de France is famous for wrecking riders. But there’s an upside to it too. If you can get round without digging too deep, the Tour, like other Grand Tours, can have a huge training effect. Most riders in the 2013 Tour took a break from racing – barring a few lucrative criterium appearances – but Ag2r-La Mondiale rider Christophe Riblon, winner of the Alpe d’Huez stage and 37th overall (one hour and 27 minutes behind Chris Froome), went straight from the Tour de France to the Tour of Poland, a 1.1-category, seven-stage race with four mountaintop finishes. Wasn’t he wasted? “For me, I’d say fatigue is more in the head than the legs, and if you have an objective and you can concentrate on it, that helps. So during the Tour, I knew I was going to come to the Tour of Poland [which started a week after the Tour finished] and stayed focused. The plan was always to ride in Poland; even from the start of the Tour, I knew that was the plan – to make the most of my form. When I won on Alpe d’Huez, we had a rethink, because there are a lot of criteriums in France after the Tour, and I got a lot of calls asking me to come and ride. To help manage the fatigue, Riblon knew that after he had finished the Tour of Poland, he was off on holiday with his wife. “I knew that after Poland I was due a proper rest, but during the race, it was a matter of staying focused on that. The mental aspect clearly plays a large part in determining how tired you feel, but, according to Riblon, “If your mind wants to carry on, even if your legs don’t, your head can decide. If you have an objective further down the road, then it’s easier to keep going. For Ag2r directeur sportif Stéphane Goubert, motivation and form go together: “Christophe finished the Tour really well, quite fresh, which is the most important thing. Psychologically if you are motivated, then you can get your legs to follow, but there is obviously a physical element to fatigue. Riblon won a stage in the Tour of Poland, finished second on another, led the race and finished third overall at 16 seconds. This article was first published in the September 5 issue of Cycling Weekly. Read Cycling Weekly magazine on the day of release where ever you are in the world International digital edition, UK digital edition. And if you like us, rate us!